There is a theory that modern man is too far out of touch with the sources of his food. We don’t live on farms anymore, or have any real contact with the animals we consume. 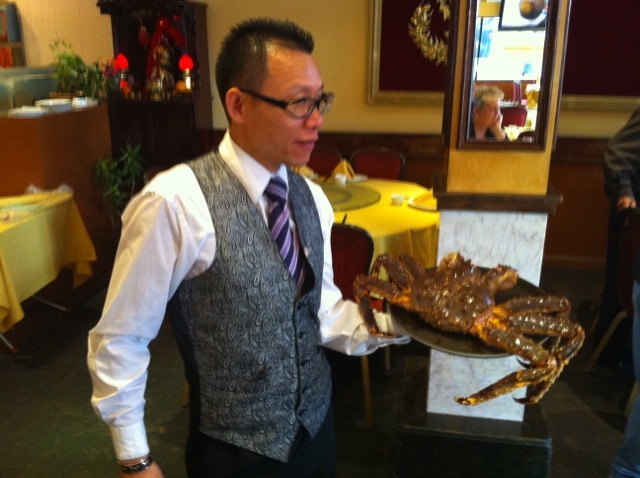 Legendary Palace, a restaurant on the corner of 7th and Franklin in Oakland’s Chinatown, gets us closer to our food by maintaining large banks of aquaria from which you choose your dinner. We went there last night with Mike and Gretchen, Winnie and Jerry. I never think its a good omen when the front of a dinner establishment has where the only thing I can read is “$1.99” and “$2.99”. I never found out what the sale items are, and nothing we had was anywhere near that affordable. The decor is the typical Chinese restaurant garish , with all the subdued lighting of a bus station. You want atmosphere? This place has all the atmosphere of the lunch counter in the downtown Shanghai Woolworths. But you don’t come here for atmosphere, you come here for seafood. Being a fan of The Deadliest Catch, I can’t look at a king crab without wondering if Cap’n Sig of the Northwestern caught it. And right there in the top fish tank was an enormous king crab, which we naturally had to have. Because it was so large, the waiter said he would prepare it two ways–one of them was in garlic sauce, and the other, um, well, I guess wasn’t in garlic sauce. The same crab, 10 minutes later. I like crab just drowned in a bit of butter. To me, the flavor is too delicate to cover with a gloppy, overpowering sauce. The did do a great job of cracking it, though. We ordered pea sprouts, and got something like the leaves of the pea plant sauteed in garlic. Not bad, but not pea sprouts, either. On the other hand, we were able to order Peking Duck without having to give 24 hours notice. Little steamed buns, crispy ducks skin backed with a layer of fat, plum sauce and slivers of green onion–this always feel to me like China’s greatest gift to dining. Winnie raved about the eggplant. I rank eggplant right next to mushrooms, so I’ll just take her word for it. Dessert was “double happiness”–they brought us two. Mango pudding, which was plenty mango-y but not very pudding-y. Way too stiff for me. Then “sponge cake”, which was more still warm from the oven and quite tasty. 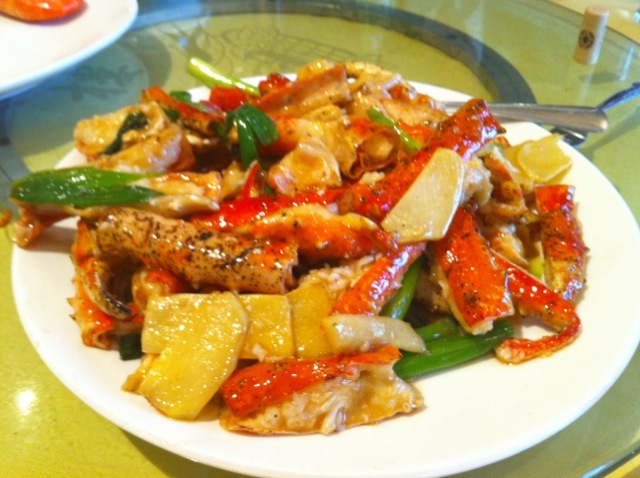 If you want great Chinese food, try Uncle Yu’s in Lafayette, or Yan’s China Bistro in Walnut Creek.